The revolutionary Lamborghini Spire S/V VRT represents the perfect marriage of the most advanced technology available in its market segment with elegant, exclusive design. Spire S/V VRT is the first machine in its specific sector to offer continuously variable transmission, together with Load Sensing hydraulic system with a capacity of 100 l/min and increased cab comfort. All the class and elegance of Italian Style, with unrivalled levels of comfort. The refined, exclusive design, in line with the Lamborghini family feeling sets Spire from the competition, thanks to a touch of class that makes all the difference. Attentive use of the latest concepts in ergonomic design means that Spire S/V VRT is in a class of its own in terms of cab comfort, thanks also to its flat platform and the vast range of possible configurations. Close attention to detail during the design stage has made it possible to implement technical features normally reserved for much more powerful models in the reduced space available, resulting in an immediate feeling and rendering the machine incredibly easy to use, even when carrying out the most complex operations. The refined, exclusive design, in line with the Lamborghini family feeling sets Spire from the competition, thanks to a touch of class that makes all the difference. Attentive use of the latest concepts in ergonomic design means that Spire S/V VRT is in a class of its own in terms of cab comfort, thanks also to its flat platform and the vast range of possible configurations. Close attention to detail during the design stage has made it possible to implement technical features normally reserved for much more powerful models in the reduced space available, resulting in an immediate feeling and rendering the machine incredibly easy to use, even when carrying out the most complex operations. 3 and 4 cylinders, to maximise handling or load capacity: which is the right choice for you? FARMotion has been designed specifically for use in agricultural applications and features a highly compact layout, essential for tractors used for working between rows, but without compromising on performance, in fact the unit guarantees torque curve and power specifications that are ideal for working in orchards and vineyards.This power unit provides high performance combined with low fuel consumption, thanks to the Common Rail injection pressures of up to 2,000 bar, the electronically controlled visco-static fan, and Stage III B emission compliance, guaranteed by the single, maintenance-free, DOC catalytic converter. And Spire S/V 115 VRT deliver 113 HP at 2.000 rpm, which is more than any other specialised tractor in its sector! The comfort of the hydrostatic solution, combined with the efficiency of the mechanical solution. In additional to unparalleled driver comfort, thanks to the new continuous variable transmission, Spire S /V VRT is capable of reaching speeds of up to 40 km/h at reduced engine speeds, enabling users to reduce fuel consumption. 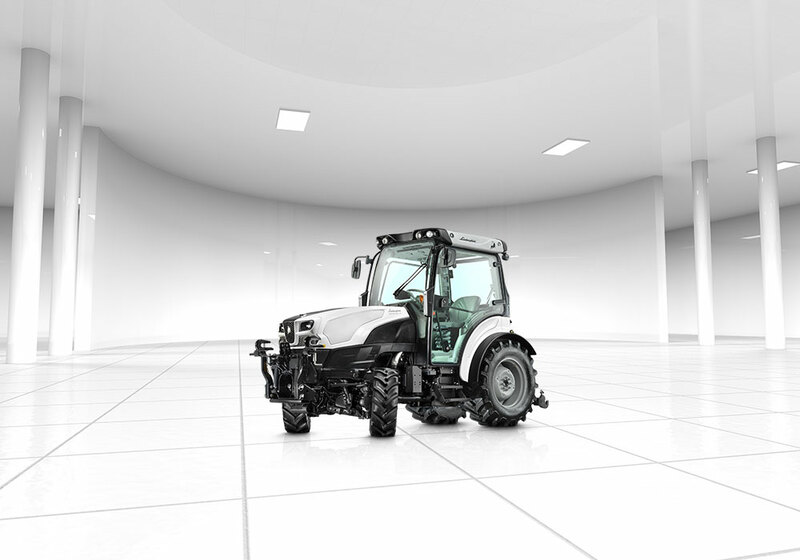 This tractor also features automatically engaging front wheel drive and differential locking, and is available with an (optional) synchronised PTO. The joystick takes the place of the accelerator, clutch, gear shift and brakes when operating the tractor! A dedicated potentiometer allows the operator select the most suitable engine management mode, optimising performance and fuel consumption regardless of the working conditions, while increasing the safety of manoeuvres thanks to the "PowerZero" function. The HPB hydraulic parking brake completes the standard features available on this range of machines. Class-beating hydraulic systems for a specialised tractor. The most ergonomically advanced solutions and a vast range of configurations: without rivals! In addition to the elegant design and unparalleled levels of comfort, the new cabs offer a wide range of configurations and trims. In fact, Spire S/V VRT is available in the flat platform version with mudguards for both low and high wheels.Another new feature is the central console, which moves together with steering column, ensuring optimum posture for operators of all sizes. The dashboard includes InfoCentrePro , the new, high-resolution colour display that integrates all the main machine functions, such as the innovative Comfortip: automatic management of headland operations. The cabs also feature newly-designed roofs, with an upgraded air conditioning system, category 4 filtration and innovative LED working lights.The cab is also available with high-visibility, openable monolithic front windscreens, as well as versions approved as PPE solutions for use when carrying out phytosanitary (Plant Health) treatments. And for all those who are looking for the maximum in comfort and productivity, the machine is also available with independent front suspension systems. In addition to the traditional floating front axle solution, Spire S/V VRT models are also available with the new, independent wheel, active control hydro-pneumatic front suspension solution, which enables the from wheels to execute vertical oscillations independently of one another.A single control unit manages the reactivity of each individual suspension unit, guaranteeing an extremely effective dynamic response and excellent precision on foliage when using implements that are fastened rigidly to the tractor body.The suspension units are also controlled electronically in order to reduce pitch and roll effects at higher speed, although this function may be disabled, if deemed necessary.